It’s been a pretty crazy week here so I haven’t had much of a chance to post any recipes lately. Sean has been sick all week, we’re trying to prepare for a trip to Charlotte next week and to top it all off, I won a trip from Guinness for a trip to Dublin! (I still haven’t gotten over the shock of that one). In between all that, I did manage to cook the meat loaf dinner this week. If you would like the recipe I use, you can check a previous post I did on it right here. For tonight, I am going to make a recipe I saw on the Food Network website for an easy Shrimp and Grits. I am not a big grits fan, but Michelle loves them so we thought we would give this one a try. This recipe cheats a little by using instant grits, but feel free to use whatever works best for you. Bring 3 cups of water to a boil in a medium saucepan over high heat, covered. Uncover and slowly whisk in the grits, 1 teaspoon of salt and 1/2 teaspoon of pepper. Reduce the heat to medium low and cook, stirring occasionally, until thickened, about 5 minutes. Stir in the Parmesan cheese and 1 tablespoon of the butter. Remove from the heat and season with salt and pepper. Cover to keep warm. meanwhile, season the shrimp with salt and pepper. Melt the remaining 2 tablespoons of butter in a large skillet over medium-high heat. Add the shrimp, garlic and cayenne pepper, if using, and cook, tossing, until the shrimp are pink, 3 to 4 minutes. Remove the shrimp from the heat and add 2 tablespoons of water, the lemon juice and parsley; stir to coat the shrimp with the sauce and season with salt and pepper. It’s a very simple meal. The prep time and the cooking time should only take you about 30 minutes in total and it will make a nice dinner. Well it’s back to the crazy week for me. More medicine to pick up for Sean, start packing for Charlotte and we have a party to attend tomorrow, so I won’t be cooking anything tomorrow. There won’t be a meal plan for next week since we are leaving to travel on Tuesday, but I do plan to blog while we are gone and post some recipes and ideas that a few readers have asked about. If you have anything you would like to see or read about, feel free to leave me a comment and I’ll see if I can fit it in for next week’s writing. Thanks again to everyone for following along. Have a wonderful Friday, enjoy your day, and enjoy your meal! Here’s a blog about meal plans from a great blog that I follow, rantingchef.com. 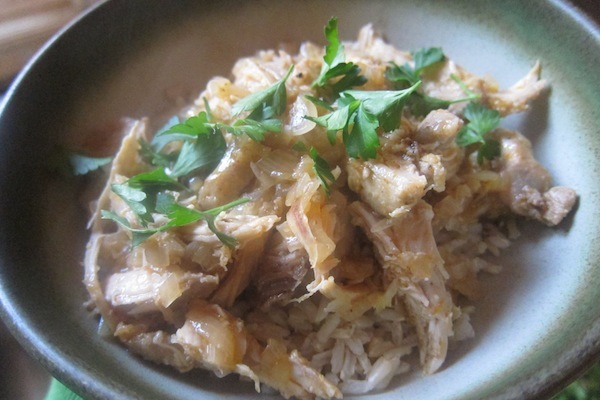 he also has found that the meal plan works really well, and there’s a great recipe for Garlic Lime Chicken there too! What do you want to do for dinner for tonight? A question which is common to too many households. Let me tell you that if you are asking that question after a long day at work, you are just as likely to order in a pizza as you are to making anything good. Tonight’s recipes are a kid’s delight (well, my kid’s anyway). Sean likes to get chicken fingers when we got out, and adding tater tots to the meal is just icing on the cake for him. Chicken fingers themselves are pretty easy to make. Some recipes call for frying them, but I have decided to go with one that bakes the chicken to make it a little healthier. It’;s a very simple recipe with not many ingredients. Preheat the oven to 400 degrees. Set a rack on a baking sheet and mist with cooking spray. Whisk the eggs, mustard and 1 teaspoon of salt in a shallow bowl. Place the breadcrumbs in a second shallow bowl. Dip the chicken strips in the egg mixture, letting the excess drip off, then coat with the breadcrumbs. Place the chicken on the rack and bake until golden brown and cooked through, about 20 minutes. A few notes about the chicken fingers. Placing them on a rack over the baking sheet is key, since it lets air circulate around the whole piece of chicken, allowing it to crisp up all over. You can buy chicken tenders pre-cut already, but they seem to be more expensive than just buying boneless chicken and cutting it yourself. Lastly, you could use any breadcrumbs you choose for this recipe; I am using homemade breadcrumbs, but if I went for store-bought, I would use panko to give you a little extra crunch. Now on to the tater tots. As I have said, I’ve never made these before. I looked at a bunch of recipes and each one seemed to have both good and bad results, so I wasn’t really sure which one to go for until I found this one from Cook’s Country. It seems simple, basic and looks like it will taste good, so let’s go for it! In a small bowl, whisk the water and salt together until the salt dissolves. Transfer the salt water and potatoes to the bowl of a food processor fitted with the metal blade and process until coarsely ground, 10 to 12 pulses, stirring occasionally. Drain the potato mixture in a fine-mesh strainer, pressing the potatoes with a spoon until dry (the liquid should measure about 1½ cups); discard liquid. Transfer the potatoes to a microwave safe bowl and microwave, uncovered, until dry and sticky, 8 to 10 minutes, stirring halfway through cooking. Stir the flour, black pepper and cayenne pepper into the potatoes. Spread the potato mixture into a thin layer over a large sheet of aluminum foil and let it cool for 10 minutes. Push the potatoes to the center of the foil and place the foil and potatoes in an 8-inch square baking pan. Push the foil into the corners and up the sides of the pan, smoothing it flush to the pan. Press the potato mixture tightly and evenly into the pan. Freeze, uncovered, until firm, about 45 minutes. Meanwhile, preheat the oven to 200 degrees. Set a wire rack in a rimmed baking sheet; set aside. Heat the oil in a saucepan over high heat until 375 degrees. Using the foil overhang, lift potatoes from pan and cut into 1¼ by 1-inch pieces (6 cuts in 1 direction and 8 in other). Fry half of the potato tots, until golden brown and crisp, 5 to 7 minutes, stirring occasionally once they begin to brown. Drain the prepared baking sheet, season to taste and place in oven. Bring the oil back to 375 degrees and repeat with the remaining potato tots. Serve warm. You could take the easy way out and just make a frozen bag of tater tots, but showing off to your kids that you can make them at home is pretty cool on its own :). I am just making some simple steamed broccoli as a vegetable, since it is Sean’s favorite vegetable and this is his meal. That’s it for tonight. Follow the recipes and you’ll be the hero of the day for the kids. Tomorrow I’ll be making Meatloaf for dinner, which is one of my all time favorites. I have made it before, but it’s a family favorite and turns up on here once in a while. I may vary the recipe a little tomorrow, so check back and see how what’s up. Until then, enjoy your evening and enjoy your meal! Tonight’s dinner is very easy and makes good use of your slow cooker. Since it’s not quite grill season yet here in New York, I decided to try a recipe from America’s Test Kitchen that uses the slow cooker for Barbecued Ribs. This recipe uses baby back ribs, my personal favorite, and has very few ingredients. It doesn’t get much easier than this one and from the looks of the ribs (they are almost done as I write this) they are going to taste great. Mix the paprika, sugar, cayenne, 1 tablespoon of salt and 1 tablespoon of pepper together, then rub the mixture evenly over the ribs. Arrange the ribs upright in the slow cooker, with the meaty sides facing outward toward the slow cooker insert wall. Pour the barbecue sauce over the ribs, cover and cook until the ribs are tender, 6 to 8 hours on low. Position an oven rack 10 inches from the broiler element and heat the broiler. Place a wire rack in an aluminum foil-lined rimmed baking sheet and coat with vegetable spray. Carefully transfer the ribs, meaty side down, to the prepared baking sheet and tent with foil. Let the braising liquid settle for 5 minutes, then remove the fat from the surface using a large spoon. Strain the braising liquid into a medium saucepan and simmer until thickened and measures 2 cups, about 15 to 20 minutes. Season with salt and pepper to taste. Brush the ribs with some sauce and broil until the ribs begin to brown, 2 to 4 minutes. Flip the ribs over, brush with more sauce, and continue to broil until the ribs are well browned and sticky, 9 to 12 minutes longer, brushing with additional sauce every few minutes. Transfer the ribs to a cutting board, tent with foil, and let rest for 10 minutes. Serve with the remaining sauce. Whisk all the ingredients together in bowl until well blended. Season with salt and pepper to taste. For this rib recipe, the baby backs work really well since they are smaller and fit in the slow cooker better than larger spare ribs. Depending on the size of your slow cooker, you may not be able to fit a rack of ribs larger than 2 pounds anyway ( I know I can’t). To go with the ribs, I decided to make some potato salad today. Like barbecue sauce or a dry rub, everyone has their own version or recipe of potato salad. I keep mine pretty simple and don’t really add anything to it. Occasionally I’ll put some diced red onion in, but that’s a rare occasion. I really prefer just the potatoes myself, but add whatever your family likes best or use whatever recipe you have been using. In large bowl combine mayonnaise, vinegar, salt, sugar and pepper. Add the potatoes and gently mix until blended. Chill for 2 to 3 hours before serving. Sean is not a big fan of potato salad, so he’ll be having a sweet potato tonight with his ribs. I am serving some corn with this meal, off the cob since it’s not in season yet, so we’ll settle for frozen this time. Tomorrow’s dinner is a Sean’s choice and we’re going to try it completely homemade. I am making Chicken Fingers, Tater Tots and Broccoli. I’ve never tried making tater tots at home before, so we’ll see how it goes. The recipe seems pretty straightforward, so it shouldn’t be too bad. Tune in tomorrow to find out how it goes! Until then, enjoy your evening and enjoy your meal! Thursday: I have down for our meat-free day, but we haven’t been able to agree on a meal for the day, so this one is still open. That looks like a pretty good menu for the week. I’ve never made the tater tots before, so that one will be something different, but it doesn’t look like it’s too hard to do. I was finally able to start growing some of mine own herbs, although it hasn’t been quite warm enough to put them outside yet, but I am just starting to get some growth out of the basil, oregano and parsley, so we’ll see how it goes. A few of my friends have approached me about things that would like to see me write about, so I’ll be taking on some of that while we are away from home and I won’t be cooking as much. If there’s anything you would like to see written here, recipes you’re looking for, new methods to try, or anything at all, just let me know. I’m open to writing about more than what we happen to be eating for the day. You can leave a comment here, send me an email at IguanaFlats@msn.com, visit my Facebook page (the link is on the right) or send me a message on Twitter (also listed at the right). I’ll get back to you as soon as I can and I love new ideas, so I am always looking for something new to try or write about. Well, back to a lazy Sunday. Sean is under the weather today, so there’s nothing set in stone for a meal today; we’ll have to see how everything goes. 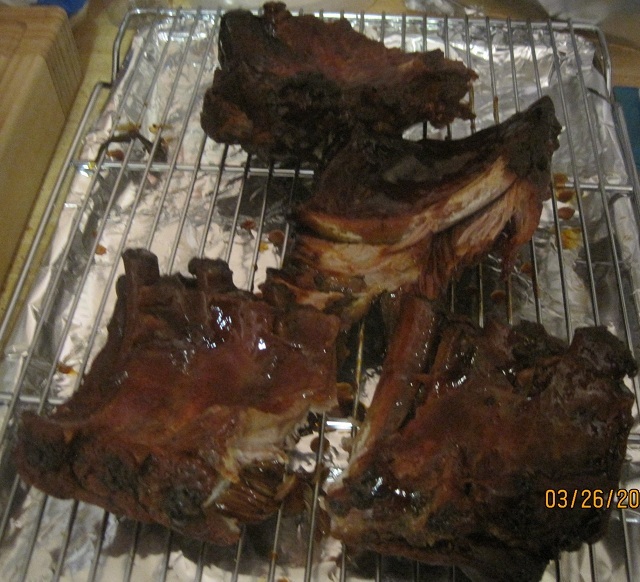 Check back in tomorrow to see my recipe for the barbecued ribs in the slow cooker. It’s a good one. Until then, enjoy your day and your meal! This recipe is from another cooking blog I follow, 35aweek.com, that has awesome recipes that are not only easy to cook, but money saving as well. Check it out and check out her blog. This popular-through-the-ages French dish is pure genius in its simplicity: chicken thighs and shallots braised in wine, chicken stock and cider vinegar. That’s it. No obscure or exotic ingredients or off-the-wall cooking methods. And the ratio of flavor to effort is phenomenal—I was pretty surprised the first time I made it. You mean I can just throw a handful of ingredients together, bake them in a skillet, and have it taste that good, for under $2 a serving? Mais oui! It’s a Baked Fish Friday! It’s Friday, so that means it’s time for our seafood meal for the week. it doesn’t get much easier than this one. i am making a very simple Baked Tilapia, with Brown Rice and a nice veggie dish of Sautéed Snap Peas, Asparagus and Peas with Herbs. First, the fish dish. There’s very little to do with this one, so it can be done quickly. Preheat the oven to 375 degrees. In a large cast iron pan, Melt 3 tablespoons of the butter over medium heat. Remove the pan from the heat. Rinse the fish and pat it dry; season the fish with salt, pepper, lime zest and lime juice. Add the fish to the cast iron pan and place 1 tablespoon of butter on each filet. Cook the fish in the oven until tender, about 8 to 12 minutes. For the side dishes, they are both pretty easy to make. The first is Brown Rice. You can substitute brown rice for white rice in just about any recipe, just keep in mind that brown rice takes longer to cook the white rice. To me, tastewise, it isn’t any better or worse than white rice, just a little different, and it has much more nutrition than white rice, so I am trying to introduce it more into our diet. This is just a simple recipe on the stove top for the brown rice. Put the rice in a small saucepan with water to cover by about 1 inch. Add the salt and bring to a boil over medium-high heat, then adjust the heat so the mixture simmers gently. Cover and cook for 30 to 40 minutes, checking occasionally to make the sure the water is not evaporating too quickly. When the liquid has been absorbed, taste and see if the rice is tender or nearly so. If not, add about 1/2 cup more of liquid and continue to cook covered. When the rice is tender, you can serve it or turn the heat off, or keep it at an absolute minimum, and let it sit for 15-30 minutes, during which time it will become a bit drier. There are a lot of things you can add to the rice at this point, like a little butter or extra virgin olive oil, some fresh herbs, grated cheese, some shrimp, or instead of cooking in water, cook in some kind of stock. Once the brown rice is cooked, you can use it as a substitute for white rice in recipes like pilaf. Now on to the vegetables. This is a recipe that I literally picked up at Willams Sonoma. They had a recipe card on the counter for it and it looked really good, so I thought I would try it. It is Sautéed Snap Peas, Asparagus, and Peas with Spring Herbs and Salt. It’s a great showcase for some spring vegetables. In a large saute pan over medium-high heat, warm the 2 tablespoons of olive oil. Add the leek and cook, stirring, until tender, about 2 minutes. Add the sugar snap peas, asparagus and shelled peas and cook, stirring, until the vegetables are evenly coated with the oil, about 1 minute. Add the water and cook, stirring the vegetables occasionally, until the water has evaporated, 2 to 3 minutes. Season the vegetables with salt and pepper and remove the pan from the heat. Add the lemon zest and herbs and stir until evenly distributed. Transfer the vegetables to a serving bowl and drizzle with olive oil. Serve immediately. Yummy, yummy! It’s a pretty easy meal to put together. If you’re looking to save some time, you can always use white rice instead of the brown, but I think it goes nicely with the fish. I have no plans for dinner tomorrow since we have plans for the evening, but I do hope to have our menu plan for next week set for tomorrow, so I will be posting that. Until then, enjoy your evening and enjoy your meal!